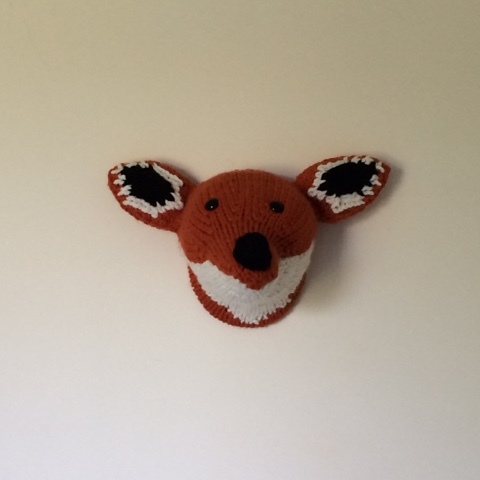 Two of my favourite birthday presents were a faux taxidermy knitted fox head kit and watermelon striped sock yarn. 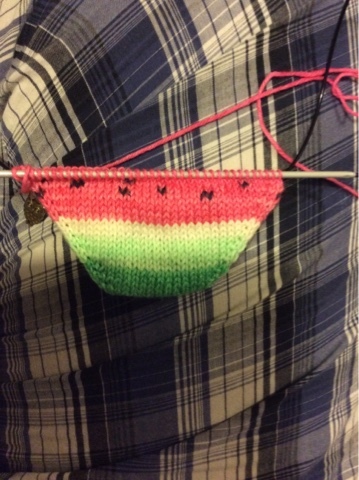 The sock yarn was brilliant from start to finish - I started knitting from a green bit and then watched how the watermelon-y bits formed. Look at those little seeds! I remembered to make notes as I went along so that I could match the socks stripe-for-stripe. Sadly my notes were completely wrong (I think I just made up some numbers) but the colours actually made it quite easy to match. I changed the decreasing for the heels slightly compared with the last pair of socks I made for me, and these fit absolutely perfectly. I love them so, so much. There was 39g of yarn left over which is too little for me to do anything with so I'm posting it to Vikki, who bought the yarn for me. I think this yarn turned into socks for her little people will be incredibly cute! The faux taxidermy fox kit from Sincerely Louise was one of those projects for which I needed to concentrate. 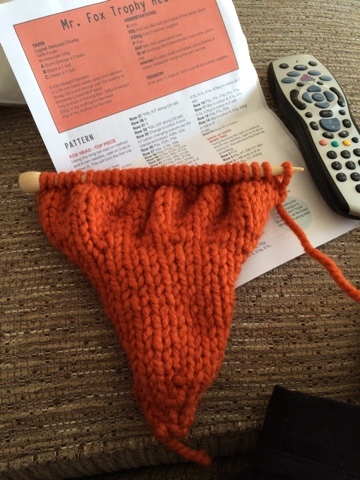 The knitting itself is very straightforward but there is quite a bit of counting. The massive (10mm) needles and super chunky yarn take a bit of getting used to as well, especially after using 2.25mm needles for those socks! I did a tension square (aren't I good?) and happily knitted away. I was taking photos as I went along and sending them to various people (my mum, Vikki, the few people in my phone who would actually be interested in stitch-by-stitch fox knitting) so apologies for the photo of the Sky remote. No idea what that's doing there! This bit of knitting is the top bit of the head. Knitting all the pieces of the fox (and learning how to change colour using intarsia, which did not come naturally to me at all) took about five hours one evening. I wanted to get sewing it up straight away but knew I needed to sleep first! 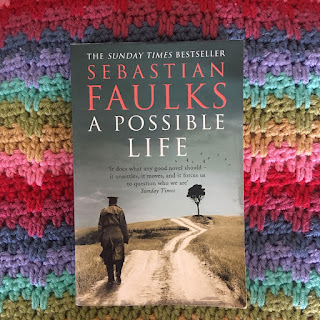 I kept going (a bit of swearing here and there, a few cups of tea, messages to mum and Vikki complaining about how fiddly it was) and it felt never-ending. The photos stopped at this point as I was getting annoyed. When the eyes and nose were added it looked much more fox like and I could see it coming together. Eventually, I had a fox. It's slightly smaller than it should be (clearly my tension changed at some point, or something happened when I was sewing it up), the nose is wonky and it was quite hard to get the backing board into the back of the head, but I am so pleased with it. Isn't it brilliant?! It was hung on the wall using only some thread from the back just for the purposes of taking a photo so it's currently on a chest of drawers in the corner of the living room and I smile every time I see it. Ben has declared it needs mounting properly, on a shield, and so Dad has been commissioned to make one. Ben also thinks we should have a deer as well, so I think he might be buying me that kit for Christmas. By then, I'll be willing to make another one, right now I don't want to do any more mattress stitching! 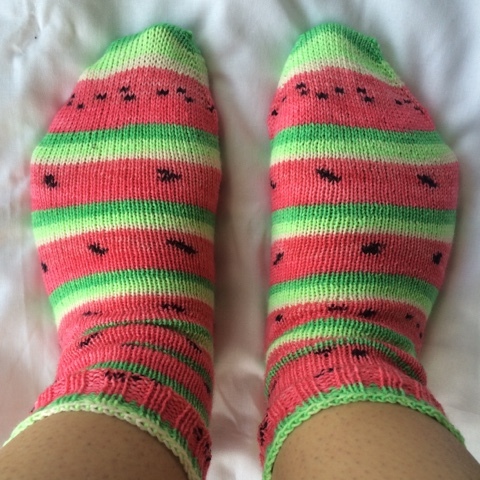 The weather for the past couple of days has been rather dreadful, but I feel much more summery in my watermelon socks! Thank you :-) although these projects look harder than they actually were (except the sewing up, that was hard). Thank you! They will bring some summer into the depths of winter when it's cold enough to wear them! You do need a Faux Taxidermy kit in your life - make sure those hints are not at all subtle! That fox is so cute! I love his cheeky little face. Can't wait to get it mounted properly - it (he?) looks a bit sorry for himself just sat on a set of drawers at the moment! 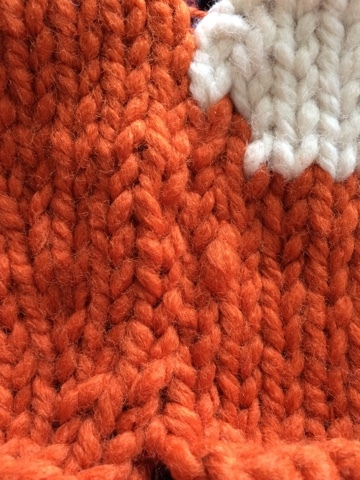 Love the socks, love the fox, such fun knits! 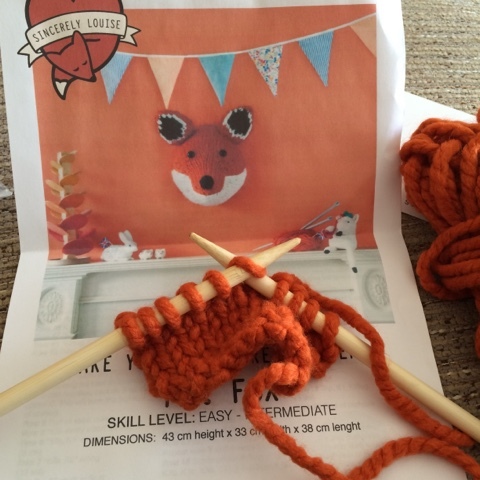 For who doesn't need a knitted fox in their lives? !